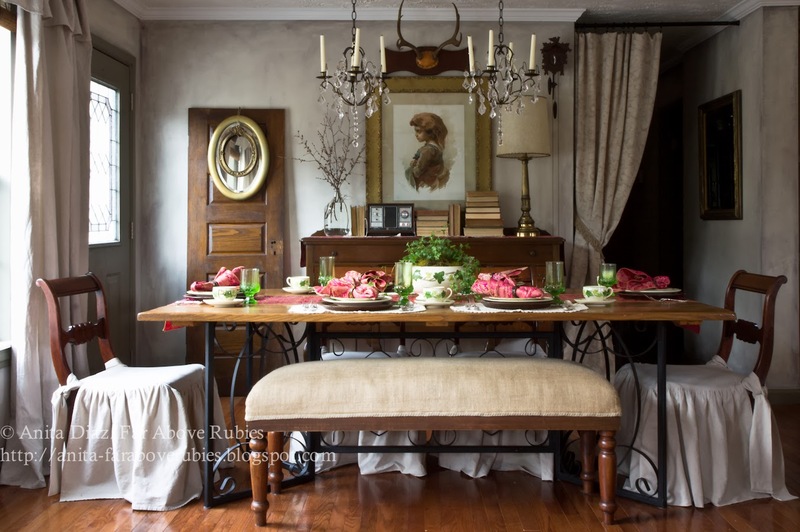 I love pretty tablescapes, and spring certainly gets me in the mood to create a nice table -- especially when it's just warm enough to head out on the porch. Here are some of my favorites to welcome in a fresh new season. This vintage Noritake Condoro is perfect for spring with its delicate floral pattern. Paired with colorful glassware and hot pink napkins, it makes a bold and modern statement. Blue Willow is classic and works for any season. Think outside the box and pair it with hot pinks, reds, or even oranges. It is so versatile and goes with just about everything. 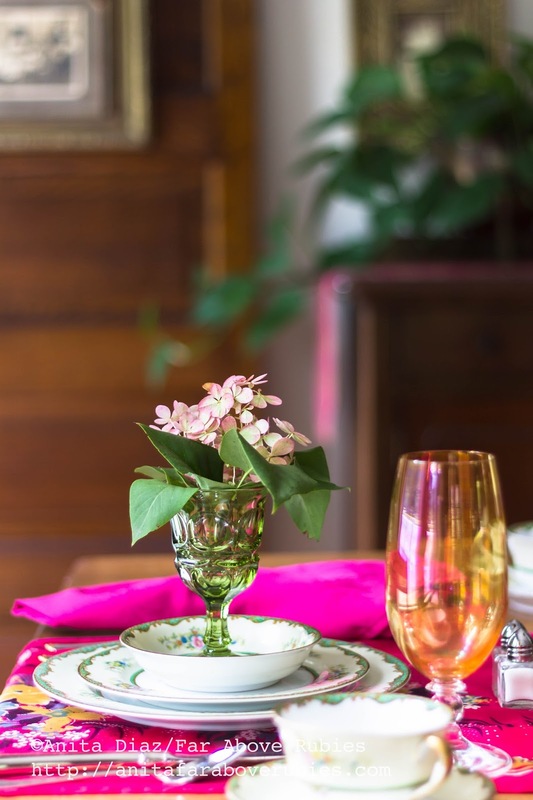 I love mixing patterns and colors, and this outdoor table with Spring Pastels mixes vintage floral salad plates with Fostoria and Franciscan glassware in different colors and patterns. 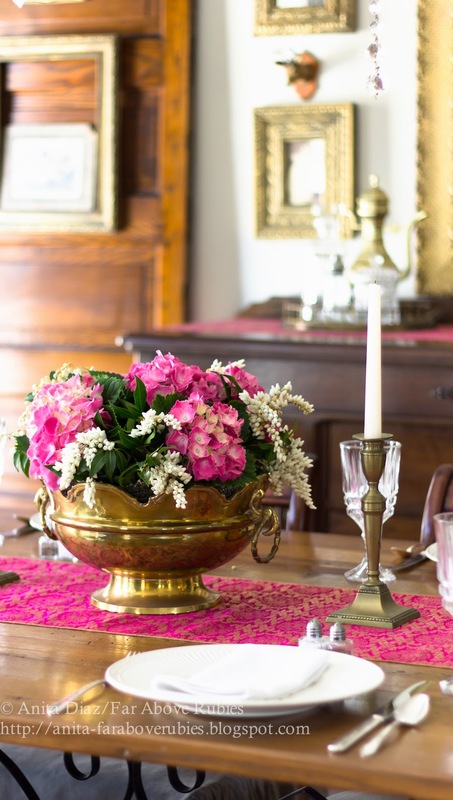 I chose to set a really simple Easter table with cream Mikasa Italian Countryside dinnerware and a centerpiece of hydrangeas from the garden center. What makes a better St. Patrick's Day table than Franciscan Ivy from I Love Lucy fame? Like Blue Willow, there are tons of different ways to use this classic dinnerware. White china is always a great choice for spring, and this Pfaltzgraff Heritage makes a perfect setting for a nice Sunday dinner. 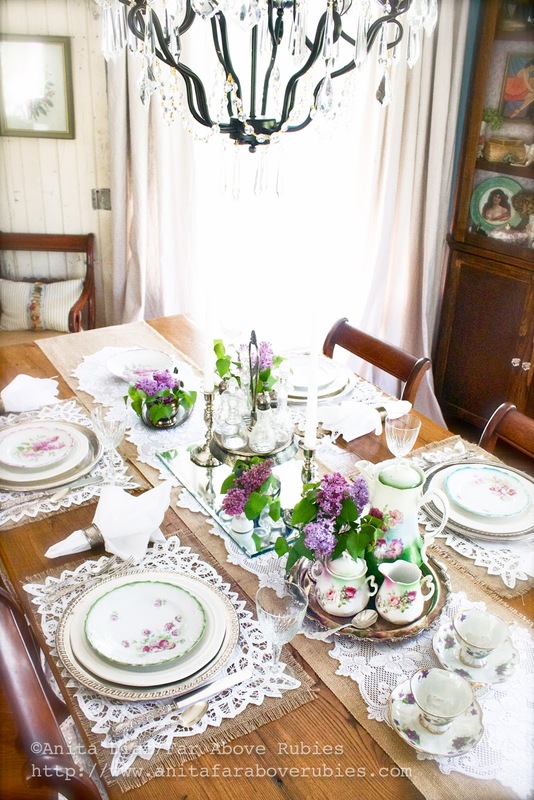 Nothing welcomes spring more than the scent of fresh Lilacs, and this table pares vintage floral plates with a centerpiece of vintage silver and lilacs. 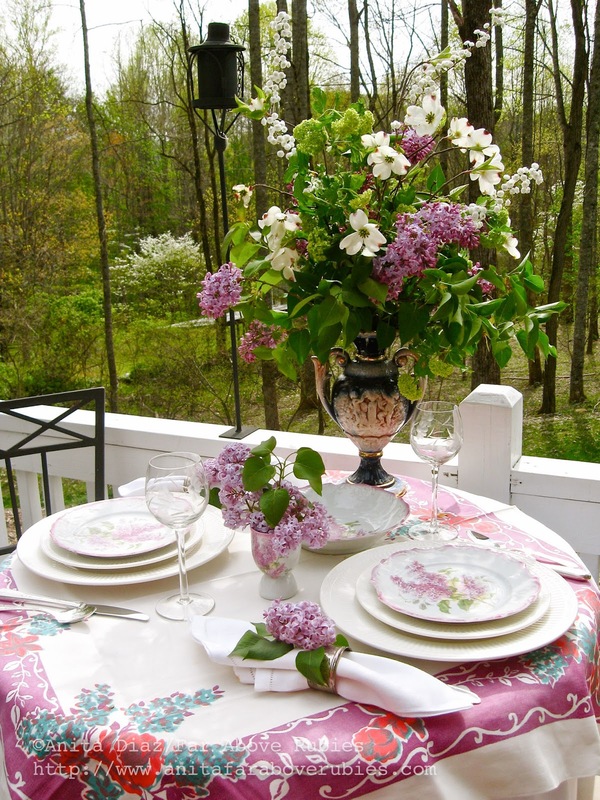 If it's warm enough, nothing is cozier than a table for two set with Lilac dinnerware out on the porch. 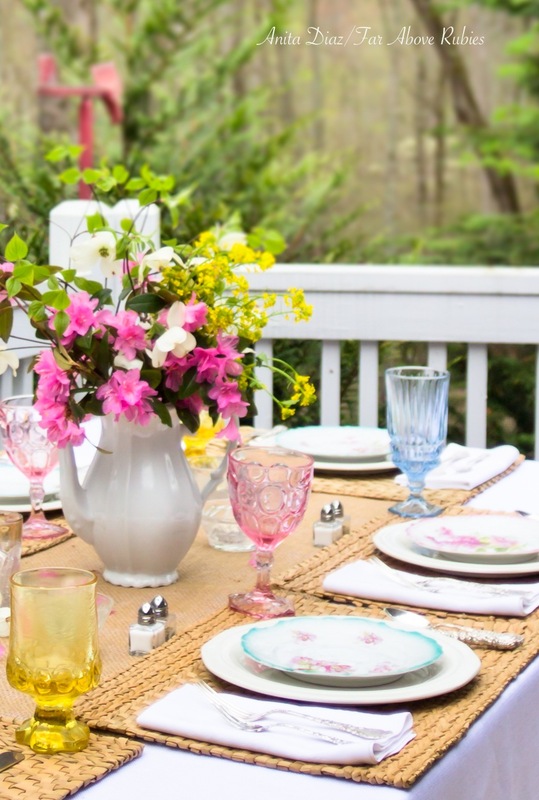 Another favorite Franciscan pattern is Desert Rose, and it makes a perfect spring table for Lunch on the porch. These are just a few of my favorite tables from the last few years. 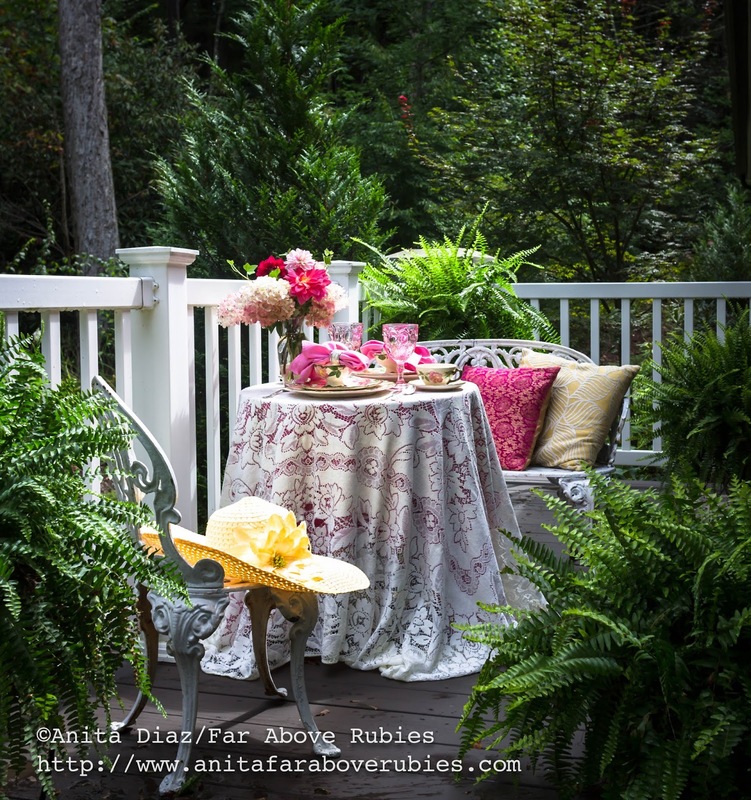 Please visit my Tablescapes Page for more links to a variety of spring and summer table settings. Thank you for the beautiful inspirations. Simply gorgeous Anita. Love the tablescape and the china is stunning. The tool box is lovely; I did mine last Spring too. Great inspiration, I'm still not into Spring décor. I'm also pretty bunnyless, lol.. Thanks so much Fabby!! The calendar says spring, but it's snowing here now!! Beautiful table settings. Picturing Lucy's dishes in her kitchen, love that show:) Desert Rose and the Lilac dishes are my favorites. Oh yes, Kathleen, Lucy is a favorite here and that's why I started collecting that pattern. Thank you!! 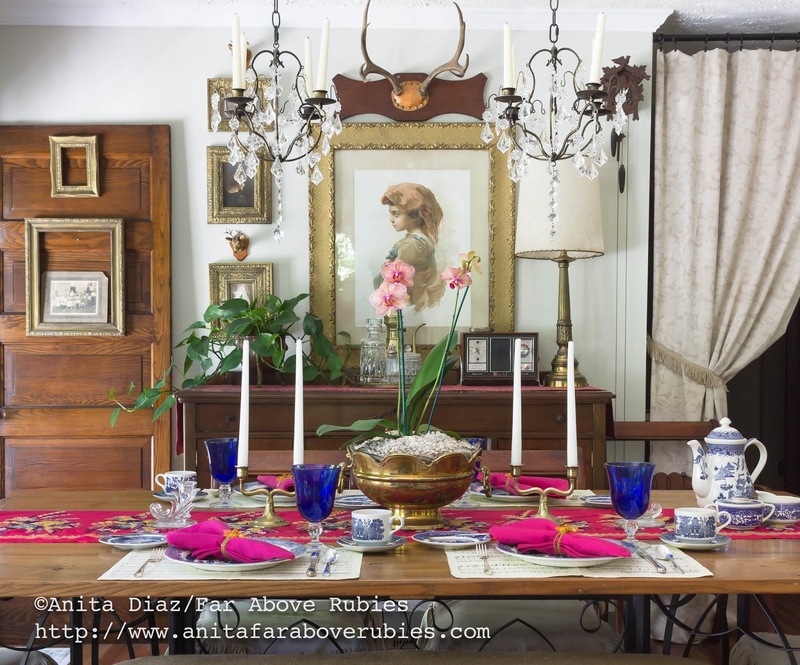 Those are some gorgeous tablescapes, Anita. All of the different tableware designs and colors are beautiful. Each table is exceptional with striking features. You have the artist touch. Oh Leslie, thank you so very much:-) Come on by!! They are all very beautiful, but I especially like the lilac tables! All these are such amazing tablescape. Really loved all of these. 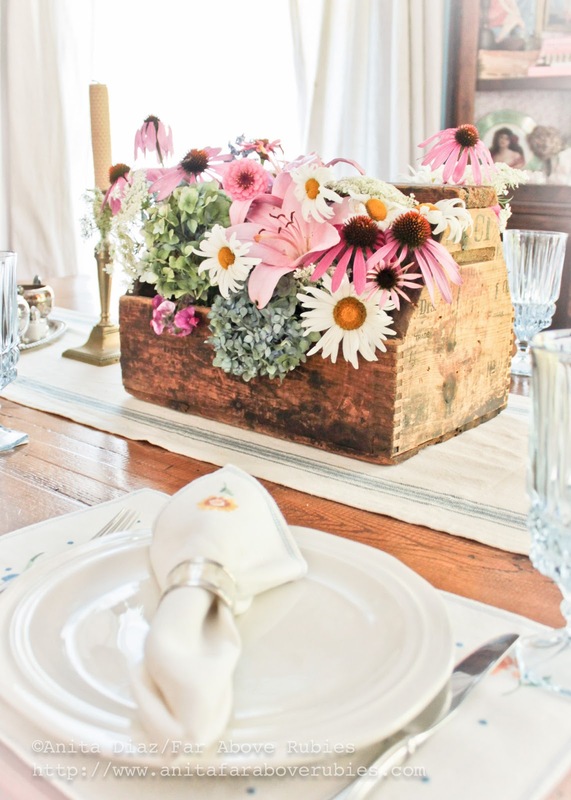 Would like to use these table décor ideas in my DIY birthday bash. Have decided to host the party at one of garden party venues in NYC. Very excited for this!